Few SUVs would be able to compete in Iceland's winter wilderness - but the Discovery impresses. A harsh Arctic wind is blasting across the Icelandic winter landscape and the snow piles up, making roads almost impassable. Our hotel destination, tucked away in the mountains 80 kilometres outside Reykjavik, is becoming ever more remote as a violent blizzard rages. Welcome to Iceland - the fringe of the Arctic Circle - and the location for the launch of Land Rover's all-new Discovery Sport. Land Rover may be intent on proving that this compact SUV, the first member of the new Discovery family, is far more than just a school-run fashion statement, but in the wilderness of Iceland, volcanic rock, snow, water and ice conspire to produce some pretty challenging conditions for any vehicle. As the car slips and slides and our wheels scramble for grip, the wrath of the Icelandic weather threatens to derail all progress on the final 28 kilometres. But in the last few kilometres we are aided by a snow plough that clears a path just enough for us to get through the treacherous conditions and to our hotel. By the time the last of our convoy has reached the hotel, conditions have deteriorated enough to force the Land Rover support crew to abandon any attempts of returning to Reykjavik that night and bed down instead in the hotel bar. The next day, ambitious plans to drive across rivers were shelved due to the conditions, but there were still mountains to tackle. 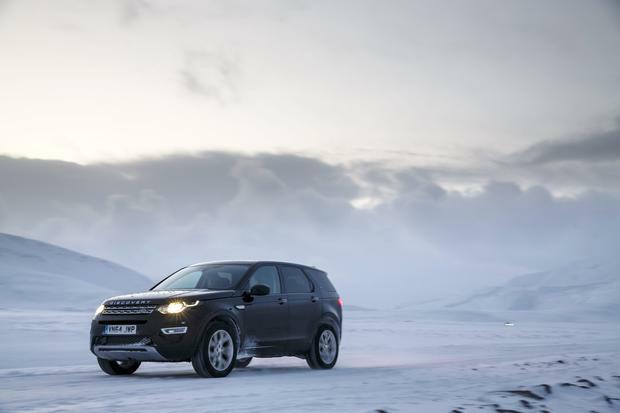 Equipped with studded tyres, the snow and solid ice proves little problem for the Discovery Sport. While we gain some useful tips about driving on snow, including that the best way to tackle snow drifts is not slowly, but with a swift and steady momentum. In truth, all of the hard work is done by the car. The Discovery Sport is available with a terrain response system - unique to Land Rover - that enables optimum traction to be engaged at the turn of a switch for a variety of conditions, including snow, mud, gravel and sand. Land Rover has also improved the hill descent, which now reacts three times faster, so when you are going down a steep or slippery slope it is easier to control the car. The Discovery Sport is the first in a new family of Discovery models from Land Rover that will in time see two more added to the range. While it is essentially a larger and more practical Evoque, it is clearly aimed at a completely different market, with the needs of a family firmly at its core. It is available in both a five-seat or seven-seat option. Inside it is particularly impressive and the amount of space, given its compact size, is remarkable. There is plenty of head and leg room, front and back, and more than sufficient room in the fold-flat third row to accommodate children or the occasional adult. There is also a new infotainment system controlled through an eight-inch screen and overall the quality of materials used throughout only adds to the premium feel. At launch, there were two diesel engines available - the 190bhp SD4 2.2-litre diesel with 157g/km and the 150bhp TD4 2.2 with emissions of 149g/km. In June, the 2.0-litre diesel next generation Ingenium engine will join the range. With emissions of just 119g/km it will also be available in front-wheel drive. There is also a choice of a six-speed manual or the silky smooth nine-speed automatic. The starting price for the five-seat option is €37,100, or €41,990 for the automatic. The seven-seat option will cost around €2,000 more. There are four trim levels - S, SE, HSE and HSE Luxury. With a smaller footprint than rivals, including the BMW X3 and the Volvo XC60, the Sport is not only the smallest car in its class, but it is also the only car in its class available with a seven-seat option. And while our trip to Iceland confirms that nature does indeed have the upper hand, the Discovery Sport is all the more impressive for how it copes with some of the harshest natural conditions on the planet. Martin Brennan Toyota calls it the hybrid invasion as it unveils the latest models to turn to the joint propulsion hybrid strategy as diesel models get the chop. The company has long been an advocate of hybrid technology and now we have one of Ireland's favourite cars, the Corolla, joining the growing list of hybrid models coming to our shores this year. Geraldine Herbert From Irkutsk we drive to Listvyanka, a small town on the shores of Lake Baikal. The 60 kilometre road runs through a white forest frozen under thick snow and was laid in just two months in preparation for what should have been a landmark state visit to Russia by the US President Dwight D Eisenhower in 1960.